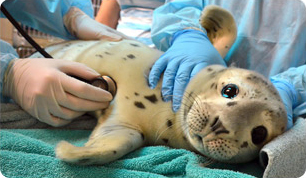 The Rescue and Response team at The Marine Mammal Center is seeking applicants for their Marine Mammal Rescue Internship working primarily with stranded pinnipeds, as well as occasional cetaceans and sea otters. This internship is an exciting opportunity for individuals who are interested in increasing their experience and knowledge of marine mammals and the Marine Mammal Stranding Network. The Marine Mammal Rescue Internship is unpaid and based in Sausalito, CA. Scholarships for subsidized housing on-campus are available. All applicants must be 21 years of age or older, with an avid interest in marine biology, zoology, general biology, policy or a related field. Interns are required to pass a background check and a motor vehicle check prior to acceptance into the internship. Applicants should demonstrate excellent communication skills and have practical computer knowledge with programs such as Word, Access, and Excel. This internship position involves a fair amount of physical activity, such as lifting, restraining and moving animals. If the intern intends to receive university credit for their internship, they are responsible for making all arrangements with their educational institution. Interns must be able to work for a minimum of 4 months, 5 days a week, at least 40 hours per week. Work schedule must be flexible and may include weekends and holidays. Please select which term you are applying to when you complete the application. This is an unpaid internship but scholarships for subsidized on-campus housing are available. Applicants are responsible for their own transportation for the duration of the internship. Unfortunately, we are unable to host international applicants at this time. The deadline to apply is Sunday, December 12, 2018 or until filled.